Expected Release: Q3 2019. Date subject to change. The King's Landing cycle takes a new approach to the A Game of Thrones LCG. Rather than following the plot of A Song of Ice and Fire, this cycle is centered around the capital of the seven kingdoms, allowing you to explore the world of Westeros more freely than ever before. Every Chapter Pack in this cycle features three copies each of twenty unique cards to strengthen your decks and help you embrace the deadly intrigues of A Song of Ice and Fire with the continued cultivation of the shadow keyword, first reintroduced in the Dance of Shadows cycle. 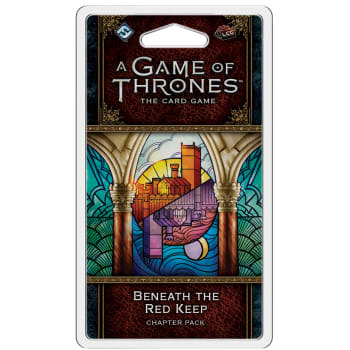 Your exploration of King's Landing takes you to the heart of the capital city in Beneath the Red Keep. With new locations that help you stand ready against any unwanted surprises your enemy may have in store, this Chapter Pack explores the Red Keep from its towers to its dungeons and in every corner, shadows hide spies and assassins all seeking the Iron Throne. Complete with a new agenda that lets you draw power from any source, this pack encourages you to make the most of the shadows, spin your schemes, and claim the castle for your own!